Two centenarians have been “executed”. The graceful copper beeches which grow either side of the early 17-century chapel in Gosforth Lane, South Oxhey, have been classified as dangerous, and have been cut down. The trees, which are at least 120 years old, have been causing concern for sometime, and two experts called in, one from Herts Forestry Ltd, and the other from Oxford University,both agreed that they should come down. 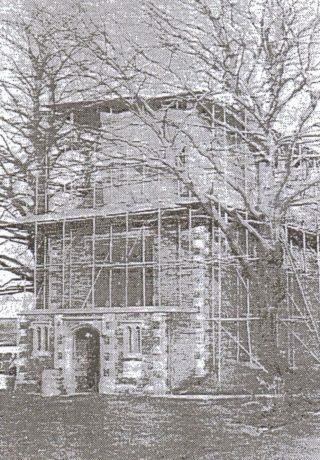 The tree between the chapel and the new church of All Saints is rotten, and the one between the chapel and the Vicarage has a weak point near the base where it was originally grafted. The trunks of the trees almost touch the chapel walls, and the chapel between the trees has become a famous beauty spot. But to a great extent they have caused a deterioration of the chapel roof by holding the rain and keeping off the sun. A the Vicar of South Oxhey, the Rev. Edward Charles, said ” Many people will be sad to see them go, myself included, but a tree can only fall once.” But the chapel, built in 1612, will not loose its charming setting among trees. Already four saplings have been planted, farther away from the buildings. This page was added on 30/01/2018.